Roll Stickers is rated 4.3 out of 5 by 6. Rated 5 out of 5 by Elizabeth1st from Great label material Love the matte label material. We used the gloss and hated because it peeled every time it got a drop of water. The matte is perfect for our bottled products and we can even write on it. Rated 5 out of 5 by Jonalbertfarmersagency from Just as ordered On-time as promised! Easy to work with and order was perfect. Rated 5 out of 5 by Cathy157 from These stickers are great 1000 sticker in four rolls of 250, super convenient. I use them to brand generic bags at craft shows and to give a professional look to my final products. Roll sticker printing can play a key part not just in your marketing and brand development, but your production line as well. 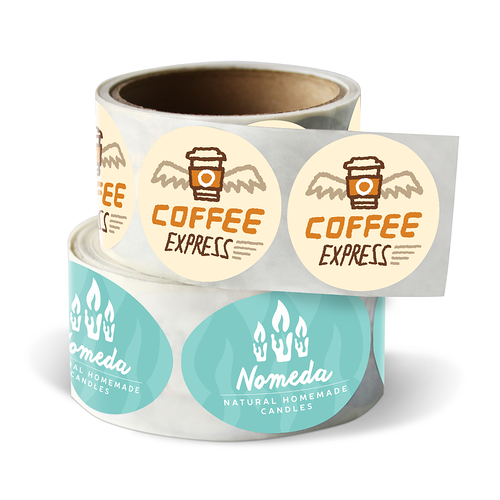 With the range of customization options, our long-lasting, and truly sticky roll stickers can easily find a place in your business. Use them in marketing and political campaigns, promotional events, and even as customized gifts and product packaging. Hand stickers with your logo out to customers and they’ll be sticking them on their laptops, office supplies, equipment cases, and notebooks by the end of the day -- creating countless impressions for your brand for a long, long time. These custom stickers come in a variety of popular shapes and dimensions. When you print custom roll stickers from 48HourPrint.com, they will arrive rolled for convenient storage and simple application. No loose stickers to deal with. They aren’t just versatile either, they’re durable too. The BOPP stock is waterproof and can be safely immersed, kept in freezers, and used for outdoor applications. They also have a quick turnaround at just 48 hours. Our roll sticker printing is high quality so our stickers last a long time, creating an unlimited number of brand impressions throughout their lifespan.Whether you’re using them for marketing, production, or simply giving them away as gifts, precision-cut and printed roll stickers give a professional look to any package. Print custom roll stickers and see the difference.